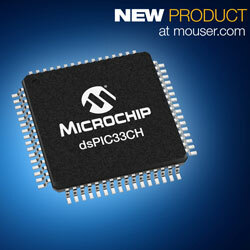 Mouser is offering the dsPIC33CH dual-core DSCs from Microchip Technology. Merging two dsPIC DSC cores into a single chip, the new devices are the first in the family with optional support for the CAN-FD protocol for robust communication with increased bandwidth. The controllers are perfect for high-performance embedded applications that need sophisticated algorithms, including server power supplies, automotive sensors, motor control, IIoT systems, wireless power, and industrial automation. The DSCs are constructed to enable independent code development by individual design teams while aiding seamless integration in a single chip. The devices’ master core drives the user interface, communications and system-monitoring functions, while the slave core performs dedicated, time-critical control code. The controllers include high-performance peripherals including four 12-bit, 3.5Msps ADCs and up to 12 high-speed PWM channels with 250ps resolution. Offering integrated power-on reset and brown-out reset, the controllers provide three low-power management modes for improved energy efficiency. The DSCs are supported by the dsPIC33CH Curiosity Development Board. Designed to make full use of the Microchip MPLAB X IDE and the MCC tool, the development board, includes an integrated PICkit-on-Board programmer and debugger, through-hole and SMT prototyping area, and two MikroElektronika mikroBUS interfaces for hardware expansion.